Metropolitan police commissioner Sir Bernard Hogan-Howe has said that police need 'millions' in extra funding to combat terror attacks in London. 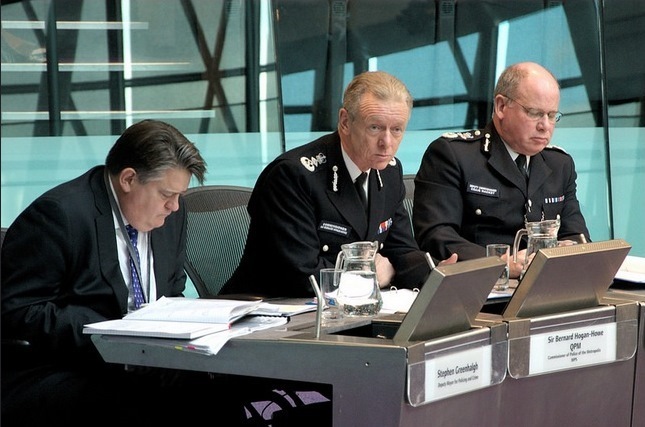 In the London Assembly's Police and Crime Committee meeting at City Hall yesterday, the commissioner also said that the number of armed officers in the capital has fallen by a third. This shouldn't come as too much of a surprise to anyone, considering cuts to the police service over the last year or so. This week London Assembly Labour research showed that nearly half of Londoners thought visible police presence is inadequate. One of the biggest hurdles the Met face is lack of funding: while the Home Office is set to add an extra £130m to the £564m national counter-terror budget, the Met will have to share it with other agencies. It pretty much goes without saying that the Met isn't sure how far its £9.4m slice of the counter-terrorism pie will stretch, and consequently it already wants more. With the current number of armed officers standing at 2,700, Hogan-Howe says that using the Met's Territorial Support Group as a reserve could also be an option. The commissioner was bullish on the capital's readiness though — despite the cuts, he believes specialist armed officers in London are now better equipped than our Gallic cousins to respond to a threat. Or are we? The Huffington Post claimed earlier this month that the populations of England and Wales are roughly the same as France. The latter has 155,000 National Police and 105,000 Gendarmerie, all of whom are armed, plus 18,000 unarmed municipal police, all of which total 278,000. The total number of armed officers in England and Wales is just 6,000 out of 128,000. Hogan-Howe has also asked TV news organisations to avoid live coverage of police action at potential terrorist sieges, like that of the recent episodes in Paris and Sydney. Let's face it, if we're being held hostage and the police are planning to storm in and rescue us, we'd probably rather not have their positions beamed around the world for our captors to see. While the Met and the Home Office bicker over who should get what, the general public are again being asked to engage in 'spot the terrorist', with a handy six point checklist. So if you see someone near Waterloo station behaving differently for no obvious reason while possessing a large amount of chemicals, call the anti-terror hotline on 0800 789321.